"May all of us... make a renewed effort to qualify for the Lord’s guidance in our lives. There are many out there who plead and pray for help. There are those who are discouraged, those who are beset by poor health and challenges of life which leave them in despair. "I’ve always believed in the truth of the words, 'God’s sweetest blessings always go by hands that serve him here below.' (Whitney Montgomery, 'Revelation,' in Best-Loved Poems of the LDS People, 283.) 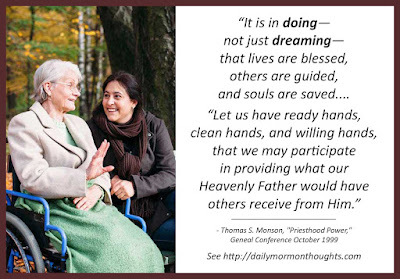 Let us have ready hands, clean hands, and willing hands, that we may participate in providing what our Heavenly Father would have others receive from Him." One of the keys to be better in doing, better in serving, is "to qualify for the Lord’s guidance in our lives." President Monson suggests that as we learn to listen to the promptings that will come to the worthy, we'll be in better position to recognize and bless those in need. So we must have "ready hands, clean hands, and willing hands." 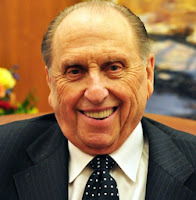 President Monson was a grand example of this principle in his own life of dedicated personal service.